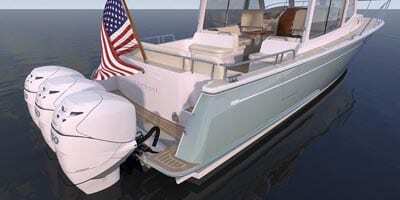 Chandlery Yacht Sales is proud to represent the MJM Yacht line of exceptional power yachts. Bob Johnson, the founder of MJM, is always soliciting owner feedback so he can bring innovation that matters to his clients. With that in mind, we’d like to introduce you to the MJM 43z. With the amazing popularity of the MJM 35z, it was just a matter of time before MJM started getting requests for larger outboard models. Boaters on the California coast especially love the reliability and convenience of an outboard as they plow through kelp beds and often like to beach their boats. 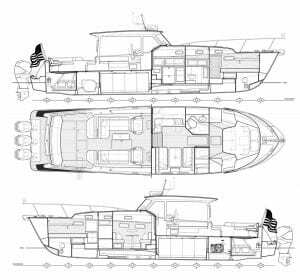 The MJM design team took client input, paired it the talented mind of Doug Zorn and Boston Boat Works to create what is sure to be the most talked about power yacht in the 40+ foot range in the foreseeable future. Why do we say this? FYI: Mercury Verado engines are rapidly gaining fans for their advanced engineering, electronics, integrated controls, autopilot, and engine trim systems, along with their quiet running and responsive Mercury service. The Seakeeper 5 gyrostabilizer option offers no-roll comfort underway or at the dock. Length On Deck (LOD) from stem to aft engine support deck is 42’ 7”. Length Over All (LOA) with engines down including anchor roller is 46’ 2”. Her shoal draft and ability to trim up the engines means she is capable of getting into places other boats her size can only dream of. Roll up Strataglass or sliding glass sides. All-weather, air-conditioned cabins and bridgedeck. 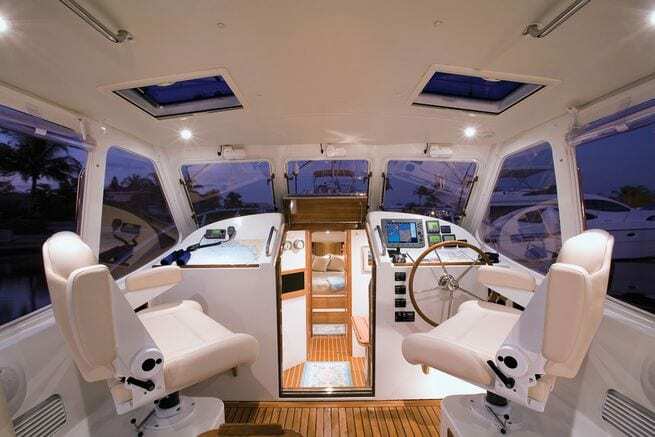 Cockpit yacht Bimini capable of remaining up at cruising speeds. Feel free to contact with questions about the MJM 43z including estimated delivery dates, pricing, and additional features.